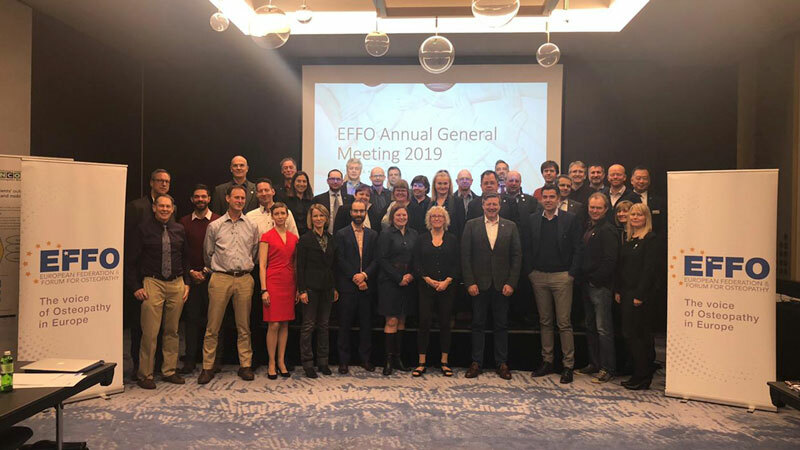 The EFFO Convention and Annual General Meeting in Ljubljana, Slovenia, was held on 1-2 February 2019, and was well attended by EFFO members, with 38 Board and association members attending from 20 countries and 23 osteopathic institutions. The event was planned in a different manner this year, in order to permit more constructive debate from members about the forward plans of the EFFO, so that these could be specifically built into the year’s business plan. The first day, Friday 1 February, was therefore spent in discussion around the issues of education policy, a common agreement on our stance on the upcoming CEN review in 2020, and a broad discussion on four key ‘pillars’ of EFFO strategic focus – regulation, promotion, research and education – around how the EFFO could be of most benefit to the member associations. The EFFO AGM was held at the beginning of the second day, with all resolutions passed, including those for the new business plan, membership fees and new budget. The President also made a presentation of Honorary Membership to Tim Walker, the retiring Chief Executive of the General Osteopathic Council, for his outstanding service and contribution to international osteopathy. The conference finished with two interesting presentations from Dawn Carnes (NCOR) about the results of the PROMs project pilot, and Jason Haxton from the A T Still Museum, on the continuing relevance of Andrew Taylor Still to modern osteopathy.